Capabilities That Distinguish the CNC Router. 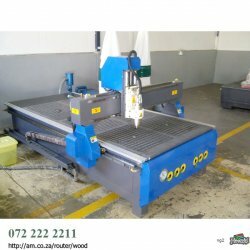 The 3kW 2000×3000mm CNC Wood Router is the most talked about product in the EasyRoute Wood CNC Routing Machine range. The product offers both a vacuum table and a sealing ring that is conjoined to it. Plus, it can hold any material regardless of how big it is. You can craft furniture or any other Wood Engraving simply by changing the tool and all this is achieved with a gentle touch of the button that smooths the transition. The Spindle is another significant part of the 3kW Woodworking CNC Routing Machine with water cooling. Besides this model, you can also find a bunch of of spindles of lots of different denominations that are associated with different tables. These adjustments and configurations help in ensuring optimal performance. For cooling, our water cooling unit pumps plus minus six liters of water per minute. Or make contact with at 0722222211 when you have any questions about our item or its add-ons. The collet system, one of the most popular ER20 systems is used in this 3kW Wood CNC Router. You can use tools of a bunch of sizes while adhering to the international standards. We give one collet nut and collets of four sizes as well as adapters free of charge. The vacuum table is designed so that it secure different elements solidly. The surface consists of Bakelite plates. There are a bunch of zones in the vacuum table and with the aid of an independent switch, you can now activate the areas that are used for holding. You may employ the usual oil that is used in the engines of vehicles. Once a week, you need to push the lever of the pump so that it reaches all of the different parts equally. Dust is created from the cutting and carving process. Based on this, a dust collection process is installed in the Wood CNC Router. With this, you can have a clean environment free of any dust. Similar to all machines, lubrication is also vital for these routers. Since there are many components and they desire to be lubricated separately, we have included a system that promises "one time" lubrication so that all the components get covered simultaneously. For further assistance, you can also contact at 0722222211 who are dedicated to providing assistance to our valued clients round the clock. We strive to give the leading available product. for CNC Laser Cutter, Vinyl Cutting Plotter, CNC Routing Machine and CNC Plasma Cut Machine and more.